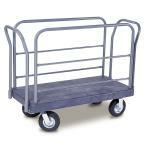 Akro-Versa-Carts In Stock for Quick Delivery! Decks are HDPE molded structural plastic for strength and long-term durability. Molded structural plastic decks have exceptional strength to weight ratios, are easy to clean, have excellent chemical resistance, and resist damage from long term exposure to weather. 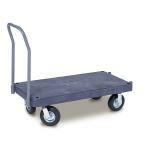 VERSA/Deck Carts are available in two sizes 24" x 48" and 30" x 60". Both can be ordered in a heavy-duty model with steel cross members to handle loads up to 2,700 pounds. 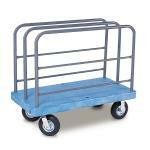 Carts are outfitted with enamel-coated, non-corrosive handles for durability, comfort, and excellent control at all times. 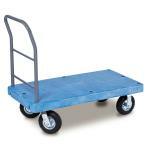 All VERSA/Deck Carts platforms have non-skid surfaces that are designed to accept a wide range of handle and rail combinations. Heavy-duty polymers withstand the toughest loads in most environments. Platform surface texture designed to help prevent slipping and shifting of cargo.